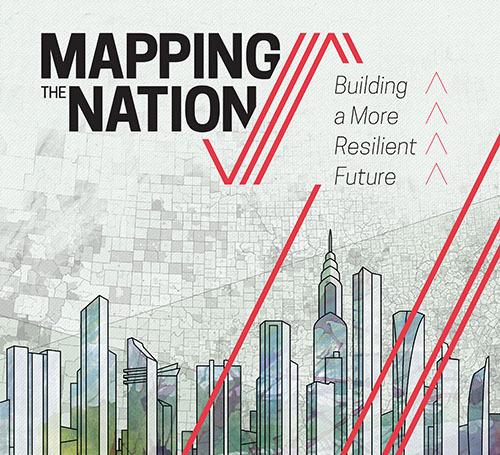 Mapping the Nation: Building a More Resilient Future. Redlands CA: ESRI Press, 2015. 5th in the series. 108 p. $19.99. 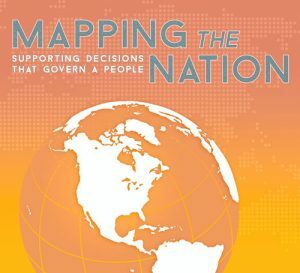 Mapping the Nation: Supporting Decisions that Govern a People. 1st edition. Redlands CA: ESRI Press, 2014. 4th in the series. 144 p. $19.95. These are the fourth and fifth of an annual publication by ESRI that showcases use by Federal government agencies of ESRI’s computer mapping software. 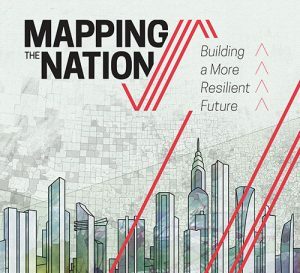 Previous publications in the series are: Mapping the Nation: GIS for Federal Progress and Accountability (2011); Mapping the Nation: Government and Technology Making a Difference (2012); and Mapping the Nation: Pioneering a New Platform for Government (2013). In one of those interesting publisher moves that turns catalogers who do not have a sense of humor grey-haired before their time, while these 2 are annuals, they are also each designated as first editions on the verso of each title page. Map librarians who are familiar with other ESRI publications – especially with the ESRI Map Book (in its 30th edition in 2015; continues the ArcInfo Map Book) – will recognize the style and format: many color illustrations that occupy the lion’s share of space, so that these books are in effect thematic atlases; clear design that makes it easy to understand what is being presented; brief, crisp prose commentary about each map; and relatively heavy, glossy paper. There may either be one map per page, or two or three. In almost all cases, a URL is given – e.g., the homepage of the government agency; the URL to the map(s) online; an ESRI URL (e.g., http://esriurl.com/8485). Be warned that the URLs may not still be live links, and readers may need to do a Websearch to find the online maps. After an introduction (composed of a foreword by Jack Dangermond, President of ESRI, and a few pages of explanation about what GIS is), each volume has separate chapters for the various major Federal agencies, arranged in alphabetical order by subject word in the agency’s name. For example, in the 2015 volume, the chapters are in order Agriculture, Commerce, Defense, Education, Health and Human Services, Homeland Security, Interior, and Veterans Affairs, with a concluding chapter on independent Federal agencies and tribal governments. These works are helpful to students studying GIS and considering GIS projects of their own, as examples of what can be done. The volumes also, when looked at in order of publication, show the progress of GIS and its applications. As such the books are appropriate for map libraries and for geography collections.